With the heavy rainfall that came to our neck of the woods Monday night and Tuesday morning, many dirt roads quickly became muddy roads, making it difficult to travel for those that frequently use them. 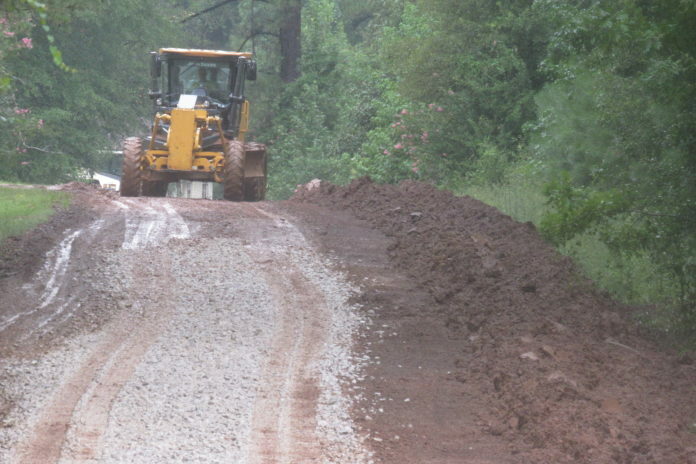 One road in particular was the Bellwood Church Road, which was quickly laid with winn rock Tuesday, thanks to those at the Natchitoches Parish Highway Department. Lonnie Guidroz and Floyd Bynog, road maintenance supervisor, watch over the process of winn rock being placed over the muddy Bellwood Church Road. Beginning where Hwy. 117 meets Bellwood Church Road, they laid gravel one mile east and one-half mile west on the road, so parish residents could travel along it safely. “We’re all soaking wet, but it doesn’t matter. This is what we’re responsible for and what we’re dedicated to do,” said Robert Morgan, of Romeaux General Contracting. Morgan said he knows a man who uses this road every day to get to the doctor. “No matter what it takes or how long it takes, that road will be passable so he can get in and out,” he said. When we talk about sales taxes in the parish that goes towards the roads, these are the men that do the dirty work. These taxes provide them with the means and materials to fix these roads. Floyd Bynog, road maintenance supervisor, said he and his crew would provide as much winn rock as necessary to make the road passable, keeping the safety of parish residents in mind. This road project was also made possible under the supervision of Parish Highway Superintendent Earl K. Townsend and Parish President Rick Nowlin. Morgan said parish employees are dedicated to providing services for the people of Natchitoches Parish. They are the devoted employees who go out, rain or shine, not just because it is their job, but because of their concern for these parish residents. Next articleDoes Natchitoches need an indoor pool?